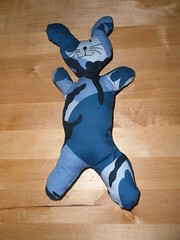 I am having a go at making soft toys! I made myself a wee template of a bunny and knocked a couple out. This is the second one. My first one is very skinny. Too skinny in fact because I didn't leave enough seam allowance... it's forearms and ears have no stuffing in them! But Tom seems to like it. He chews it and hugs it. It's black & white (contrast is supposed to be good for him) and has a blue ribbon tie and a cotton tail for something to tug at. I think they only like them because Mummy made them! I've made one for Baby Ben, and I'll make one for Antoni & Hadil's baby when he comes too (he's a week over due by the way!) then I'll have to get back on with my Christmas Makes because time is getting on and I am getting behind!